A total of 1,031 players made the trip to the Atlantis Paradise Island in the Bahamas for the 2014 PokerStars Caribbean Adventure $10 million guaranteed main event. After five full days of play there are now only eight players remaining to battle it out for the title and the first-place prize of $1,820,420. The chip leader heading into the final table is 27-year-old Estonian poker pro Madis Muur with 6,205,000. 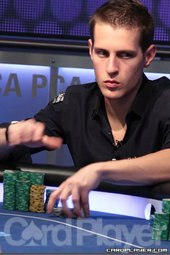 Muur play primarily online, only participating in his first few live main event’s on the EPT after qualifying online. The Talinn resident finished 12th in the European Poker Tour Barcelona main event last fall for $77,981. Prior to playing this tournament that was by far his largest live cash, but by making the final eight in this event he is guaranteed to add at least $173,220 to his career earnings. Canadian poker pro Mike “Timex” McDonald will enter the final day in second chip position with 5,605,000. The 24-year-old has over $5.8 million in career live tournament earnings, with his largest ever score coming from his win in the 2008 EPT Dortmund main event for more than $1.3 million. McDonald is looking to be the first player in EPT history to win two main events, a feat that has been elusive for over nine and a half seasons so far. 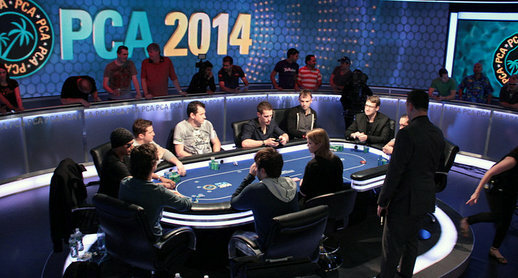 Other notables at the final table include Canadian 2010 World Series of Poker gold bracelet winner Pascal Lefrancois (5,595,000), 2013 WSOP main event 17th-place finisher Fabian Ortiz from Argentina, 2007 Card Player Online Player of the Year Isaac Baron (2,995,000) and online tournament specialist Shayam “g’s zee” Srinivasan (1,505,000). Srinivasan is the shortest stack, but is not in desperation mode as he will start play with nearly 38 big blinds with the forced bets at 20,000-40,000 with a 5,000 ante for the remainder of level 26. 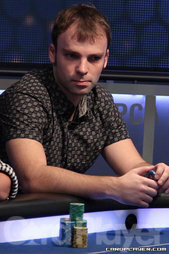 Play ended with the elimination of Max Silver in ninth place. That hand began with a raise to 85,000 by Pascal Lefrancois and a call from Isaac Baron and Silver, who was in the big blind. The flop brought the K Q J and all three players checked. The turn brought the 8 and Silver moved all-in for 600,000. Lefrancois made the call with the K 10 and was ahead of Silver’s A 4 . The river sealed the deal when it brought the K , securing the pot for Lefrancois and sending Silver to the rail. For his deep run the recent EPT Prague sixth-place finisher earned $135,400. Live streaming coverage of the final tomorrow starts at 2:00 PM EST on Pokerstars.tv. The broadcast is “as live,” with a one hour security delay because hole cards are being shown.